Hosking and its variants (Hoskin, Hosken, Hoskings etc.) is one of the more common Cornish surnames, ranking in the top 15 in the 1950s. The name was at that time found across Cornwall although there was a preponderance in the west. Hayle, Penzance, St Buryan, Redruth and Truro in that order housed the greatest number of Hoskings. Yet there was also a considerable cluster of Hoskings at Saltash, well away to the east. There are broadly two theories attempting to explain the origin of this name, one of them Cornish and the other English. One suggests that it was derived from the Cornish placename element heschen (sedge, or an area of boggy ground). This could be a general topographical name, from someone living in the vicinity of this landscape feature. Thus, Richard Blewett in the 1950s proposed it was the Cornish equivalent of the English surname Sedgeman. Or it could be a locative name. There is one place in Cornwall called Heskyn – in St Germans parish, while the same element appears in the names Penhesken in Ruanlanihorne and Poliskin at St Erme. In these it was normally spelt hesken, although we can find a Penhoskon spelling in 1249 and Heskyn in St Germans was spelt Hoskyn in 1314. On the other hand, English surname dictionaries tell us the name was a patronymic. The -kin was added to Os- to make a short form of first names like Osgood, Osborn and similar. The Oxford Names Companion specifically cites the name as the Middle English Osekin, a diminutive of names beginning Os-, and asserts that it is found mainly in Devon. However, this is not the case. In the late 19th century, Hosken was 70 times more likely to be encountered in Cornwall than in England, Hosking 58 times and Hoskin 33 times. Only the Hoskin variant was anywhere near as frequent in Devon. Incidentally, the spelling variants indicate nothing more than changing fashions. The universal spelling in the 16th century was Hoskyn. A preference for Hoskin in the 17th and 18th centuries then gradually gave way to Hosking by the mid-19th century. Does the distribution pattern of the name shed any light on the explanations for its origin? In the 19th century the surname was concentrated in the western, mining parishes, from Gwennap to St Just. 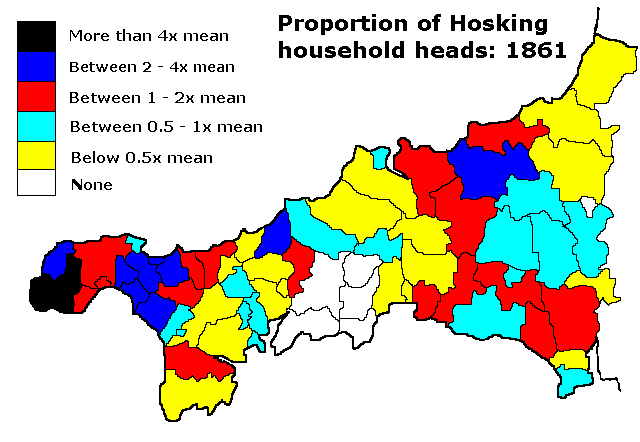 But there were also concentrations of Hoskings in south east Cornwall and to the north of Bodmin Moor, with an interesting gap in between, where relatively few Hosking households could be found. If we express the number of Hosking households as a proportion of the total we get the following map. This more clearly shows there were two blocks of Hosking names, one in the west and one in the east. This pattern repeats fairly closely that for the 18th century, although the western focus was then more narrowly restricted to the parishes between Sancreed and Lelant. Migration outwards to St Just and Camborne seems to have been a feature of the century from the mid-1700s onwards. In 1641 the distribution was more even. There’s still a hint of three foci – in west Penwith, the south east and on the coast north of the Camel, while Hoskings were relatively thin on the ground in parts of mid-Cornwall and the far east. This latter does not therefore support the notion that the name had spilt over the Tamar from Devon. The earliest map reinforces this. The name in the early 16th century was found in the far west and into the Lizard, as well as along the coast between the Fal and St Austell Bay. Meanwhile, in east Cornwall it was less frequent generally but there were two concentrations of the surname – at Tintagel in the north and St Ive in the south east. 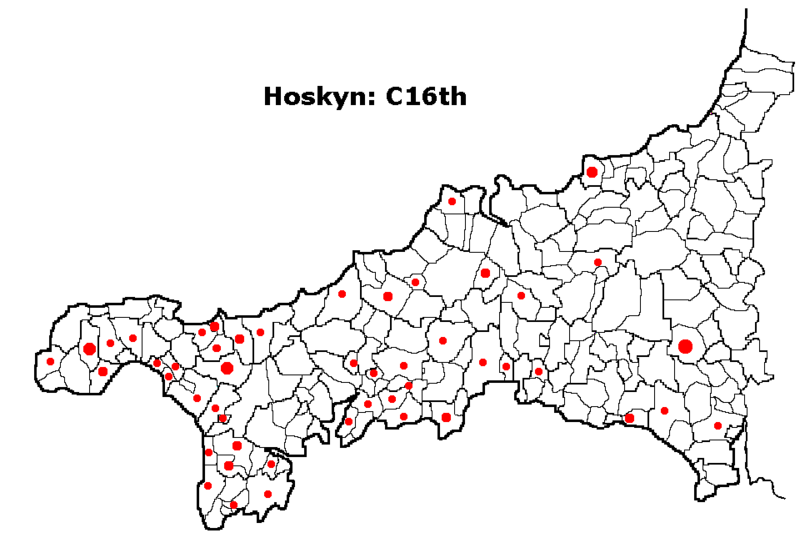 The number of families with the name Hoskyn in the early 16th century would strongly suggest multiple early origins. It was particularly frequent in Cornish-speaking west and mid-Cornwall, where surnames at this time were still liable to be unstable and not always hereditary. Given the relative rarity of sedge marsh in Cornwall, the name looks too common to be topographical in origin. However, the usual explanation of its origin in a Middle English Osekin, a diminutive of names beginning Os-, also seems unlikely in view of its location in the Cornish language zone. Moreover, it’s always spelt with an H, never without. So why had all the Oskyns gained an H, whereas none of the Osborns had? Similarly, it’s possible some of the Hoskyns in south east Cornwall may have had their origin in the Heskyn settlement in St Germans. But this single placename is very unlikely to have given rise to such a strikingly scattered distribution across the west this early. On the basis of this, and without trying to find earlier examples, the precise origin of the name must for now remain shrouded in some obscurity. I would suggest the widespread early distribution, especially in the west, suggests a family name. No reason this could not have been Irish. Yet the ramification of the name by the early 16th century looks too early (surnames were only just becoming hereditary in the west) to have an Irish origin. We might expect the latter, in the absence of any recorded major immigration flows from Ireland (as opposed to Brittany), to be at first more geographically restricted. Incidentally, the earliest reference to the surname I have is John Hoskyn at Lanivet in 1464. Has anyone found an earlier one? How about the translation of heskyn as saw? For example in Breton ‘heskenner’ would be the equivalent of sawyer. Straying a little from Cornish again, in Breton we also find heskiñ ( tarir = dry up / peter out), heskin (persécution) and hoskiñ (to notch). It’s not very academic at all but, in my time here in Brittany, I’ve not come across any Breton family names that resemble Hoskyn or any of its variants. Do you know of any here or in Wales? Thanks for all your work. I had learned from an archivist that the Hosking name was derived from “Os’s Kin.” Maybe Saxon, or Anglo Saxon tribal groupings under the tribes of Os. I’m guessing this is mostly speculative. Thanks. My great grandfather died in 1888, was buried as in Sardis, Ohio, as Archibald Hoskinson. My grandfather was 10 at the time. But, 31st some time he became Charles Hoskins. In tracing genealogy the name was found in immigrants from Lancashire, England as Hodgkinson. Any one have thoughts if the name is Cornish or English. “Hoskinson” , changed about 1880 to Hoskins. Tracing backward the English Hodgkinson, of Lancashire, England, is found to be the immigrant to US. Do you have any thoughts as the name relates to Corwall and the Cornish study so well described. Robert Hoskins. Hi Robert. Perhaps it doesn’t. Names with -son as a suffix are common in Lancashire and the north of England but rare in Cornwall. For some reason your ancestor preferred Hoskins to Hodgkinson, perhaps because it was shorter and less easily misspelt. My gt gt gt grandmother was elizabeth hosking, there are varit ions of it in my family tree. Heskin, hoskin and hosking. They were from Paul, nr newlynn, cornwall. Hi, my great nan was a hosking from penzance area but I think she might of also lived in Devon. She had a few brothers and I think sister. Would be great to see where exactly she lived. She died in 1986 in New Jersey. I’d be inclined to believe that the name originates from the Dutch name for a maker or seller of hose (garments for the legs) – there is a baptism recorded at St. Columb for ‘Johane, daughter of Harrie Eosagan on the 5th of November 1552’ – as a family of some note in St. Columb, I do believe they left Cubert and headed Eastward sometime later in the scheme of things? Were there not a good many immigrants from the Lowlands in the aftermath of the violent storms which hit the Northern Coast of Europe? King Henry had hoped these refugees/immigrants might benefit the country, by their woollen manufacture expertise; but being somewhat frustrated, by their rather unsettling effect on the populous of London – he duly sent them over to the areas of Rhos and Daugleddau near Pembroke. This caused many native Welsh to lose land, and equally caused a good many to question as to whether their established culture could weather this sudden invasion. I do wonder as to how many made their way here to Cornwall?